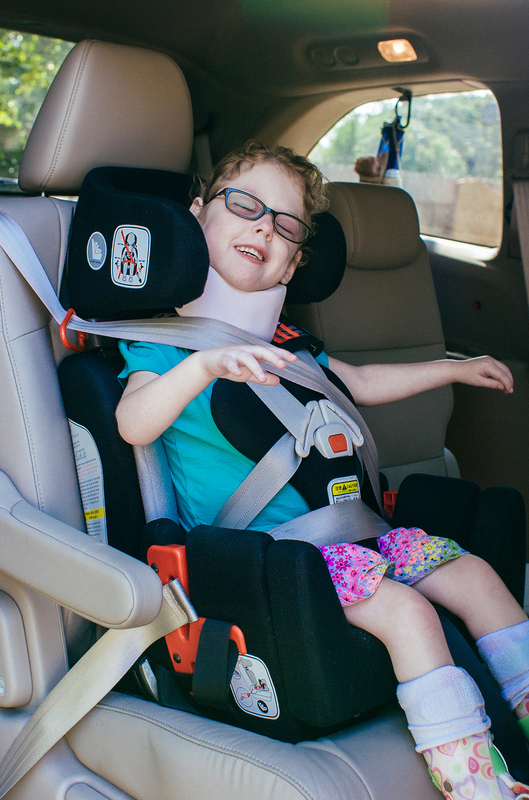 It's been nearly a year since Caleigh received her car seat last October. 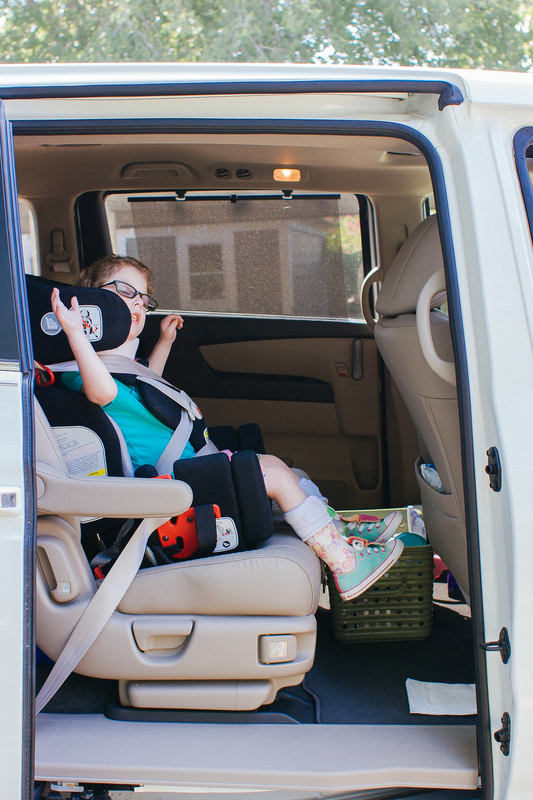 It took me awhile to come up with this review mostly because I currently have a love hate relationship with the Convaid Carrot 3 Car Seat . Our insurance paid for the car booster seat, and I remember it being over three thousand dollars. The price is pretty ridiculous for starters, but it dutifully falls in line with all the other "special" equipment prices. One thing that I don't like about this seat is the fact that it can only be reclined safely at a 30 degree angle while in a moving vehicle. Convaid markets this car seat as having "Free angle recline." Talking about diaper changes and comfort during long trips. 30 degrees isn't a lot. They must be referring to just sitting in the car. Not actually riding in it. It will recline all the way back as far as your vehicle's seat will go, but safety wise all the testing was at 30 degrees. Caleigh's first car seat was a Britax Boulavard. It had pros and cons too, but It had a lot of recline mainly because it was a convertible car seat. Technically Caleigh still fits in the car seat, but her trunk alignment is pretty terrible. We've kept it in our second vehicle. The Carrot is a booster seat. Due to the lack of safe recline available, Caleigh's head has a hard time staying upright. I've written about this before when I posted about purchasing Caleigh a Danmar Swirl Collar. I just wish there was more recline available. There is a wedge that you can buy that wasn't part of our initial purchase. I'm not sure what the safety information on using this wedge to recline the child is, but I plan on looking into it. The seat can grow in height and length, but not in width. Caleigh is a skinny mini, so not being able to grow the width isn't a problem right now. The weight requirements on this seat are 30lbs to 108lbs. Caleigh is 32lbs right now, and on the starter end of using the seat. We have seat extensions that were ordered initially so that we can grow the seat with Caleigh. We also have chest laterals and a pummel that we aren't using yet. Although, I plan on putting the pummel to use soon. Caleigh wasn't long enough to use the pummel when we first installed the seat, but I think she may be ready now. There are also options for a padded seat tray, foot rests and shoulder wings for added support. We didn't order those. The seat comes in blue, black and orange. Caleigh chose the black. 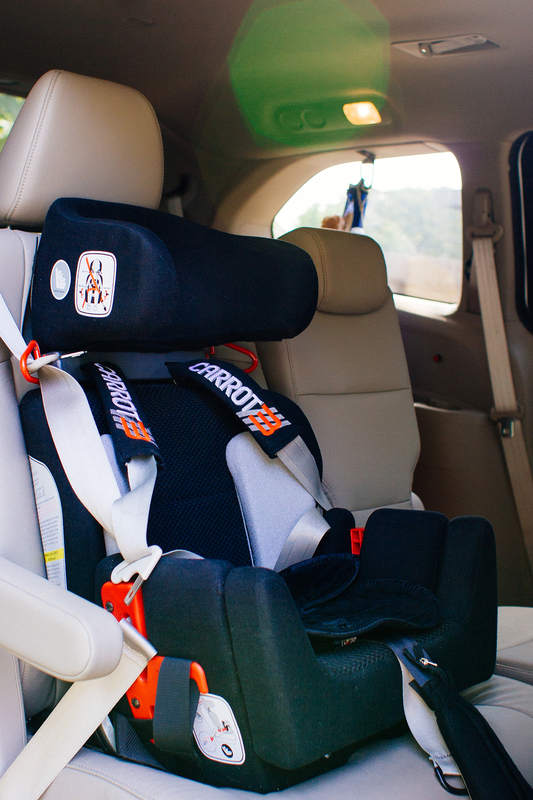 Just like most other car seats, the Convaid Carrot 3 has a five year limit. So in five years something new will be out, and Caleigh will most definitely be larger. A few things that I like about the seat are the padding options. There are pads that act as support for Caleigh's trunk. There is a seat pad if you want to help keep your child's hips in line. The harness area itself is very padded, and I appreciate this when thinking about the thinness of Caleigh's abdominal muscles. Although the large harness does get in the way of taking her in and out of the seat when her legs are straight in extension. The black area of the seat is made of a firm padding and doesn't seem to add much comfort to the seat. The side impact protection for the head is pretty impressive, although I think that Caleigh bringing her head down has a lot to do with not being able to see around the head wings. She also loves to chew and mouth the harness which is another reason she keeps her head down. I feel gross even typing this out, but I haven't washed the cover yet. Yuck, it's almost a year old now. Caleigh hasn't had any accidents that the piddle pad didn't catch, and the fact that she doesn't eat or drink in the car probably makes it cleaner than most. It's going on my to-do list though. So I can't say whether or not it's difficult to clean yet. The car seat isn't hue, but I can imagine it being very large in the top growth settings. We don't take the seat in and out of the van. That said, it isn't too difficult to install since it is a latch seat. Because this is considered a booster seat, the lap and shoulder seat belts have to be used. Even though the seat has a latch system in place it still needs the seat belts to keep the child secure. 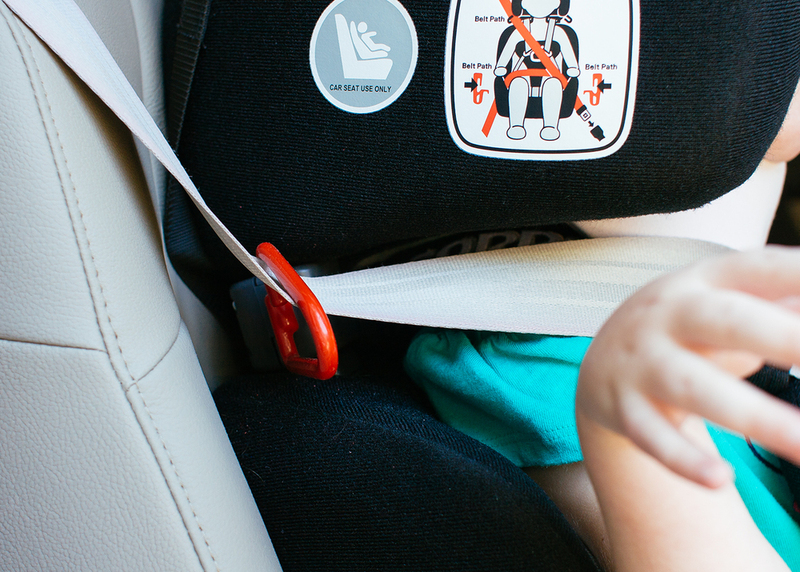 The car seat also needs to be used with a back of the seat anchor tether strap. Because of the seat belt and strap configurations this seat cannot be used with a Bruno Turny Seat or Valet. In seeing these photos, I think we will be doing some adjustments to the height and adding the pummel to Caleigh's car seat. This last growth spurt really caught up to us in all areas. I would really like to be able to try the Recaro ProSPORT booster seat and may try to track one down soon. It's a typical car seat with a high 5 point harness height and weight. Other special needs seats of interest are the Snug Seat Pilot, Special Tomato MPS Car Seat, Britax Travellor Plus EL and the very impressive looking, I can't wait to get my hands on it... Recaro Monza Reha Adaptive Car Seat/Booster. We've sat Caleigh in the Britax before and I wasn't impressed with it's support considering it's size. Since the Convaid Carrot was already purchased with our insurance, they won't pay for another one without Caleigh outgrowing this one, or five years; whatever comes first. Bottom line, it is hard to get a child with dystonia into a car seat. For us, the car has to be off and the radio definitely has to be turned off. We practice breathing techniques, or sing a quiet song so that Caleigh's muscles can relax just enough to get her bum all the way back in the seat. It's just a challenge. Period. So like I said before, I have a love hate relationship with this car seat. I don't know if it's "The One," but it will just have to be for the foreseeable future.